Backyard birding is, as both a method and philosophy of watching birds, decidedly distinct from field birding. One of the main differences is that backyard birders usually indulge from the comfort of their own homes, often while attending to more productive tasks than just ogling avians. Also, backyard birding requires a lot less effort, unless you count hanging an arsenal of feeders, keeping them stocked, and fretting about rapacious squirrels and starlings. Considering the huge contrasts, from commitment of resources to contributions to avian welfare to general level of exertion, it’s no wonder that an occasionally impassable chasm lies between field and backyard bird watching. Why is it then that field guides tend to serve the former while overwhelming the latter? After all, the bird species likely to visit a feeder in a North American temperate zone can almost be counted completely on one’s fingers and toes. Consulting the Sibley Guide to ID a feeder bird is practically overkill, often overcomplicating the issue. For this reason alone, friends of feeder birds will enjoy Audubon Backyard Birdwatch by Stephen Kress. This pocket guide focuses on the usual suspects of backyard bird watching, providing as comprehensive and striking a visual representation of that class of seed-eater and suet-swallower as I’ve seen. Audubon Backyard Birdwatch is published by DK, the artistic masterminds behind BIRD: The Definitive Visual Guide, so you know from the start that this book looks great. By the same token, the involvement of Audubon assures a prospective purchaser that this resource is developed by birders for birders. More to the point, it’s designed with meticulous care for backyard birders, particularly those looking to learn more about both the avifauna and ecology of their American estate. 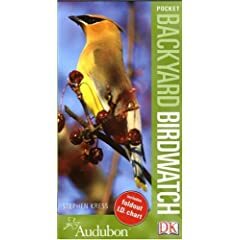 Audubon Backyard Birdwatch includes ample information about basic ornithology, identification, and, of course, how to transform a backyard into an attractive habitat for birds. It even includes a fancy fold-out poster depicting common species from across the United States. Beautiful book though it is, Audubon Backyard Birdwatch is hardly for everybody. A resource this well-suited to its target audience might be of little interest to birders without a feeder fetish or those who know their way around an unabridged field guide. Instead, I strongly recommend this book for anyone open to a deeper understanding of the ecosystem outside their kitchen windows. Such a handsome, portable package makes an ideal gift, quite timely as the Great Backyard Bird Count approaches and inspired enough to turn any backyard bird watcher into a full-blown birder.